The first chapter focussed upon the measurements themselves. This chapter takes the circulation of those measures as its focus. 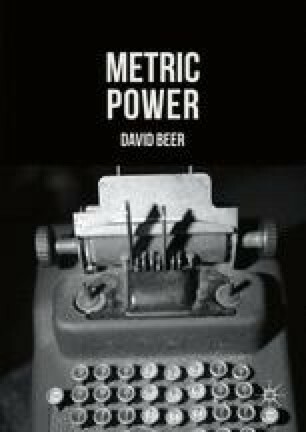 The central premise of this chapter is that in order to understand the power of metrics we need to understand not just what is being measured but how those measures then feed back into the social world. The suggestion is that it is through circulation that certain metrics gain purchase. This chapter is used to open up a range of issues, most notably around the complex interplay of visibility and invisibility that is afforded by circulating metrics. The chapter also examines the role of infrastructures in sorting and filtering the circulating of metrics.